If you’re looking for a recipe that makes a dense, chewy granola bar and doesn’t call for peanut butter or eggs, this one is perfect! Loaded with nuts, pumpkin seeds, chocolate and cranberries, these walnut granola bars are held together by a paste made of apricots, butter and honey. The recipe is originally from the California Walnut Commission where they make it in a 9×13 inch metal pan. Since I’ll probably be eating all of these myself (I slipped half of one into Fuzz’s lunchbox and am waiting to see if she likes it), I made a half batch using an 8 inch square pan. And while the original recipe calls for a food processor, I was able to get away with using my mini chopper to make the apricot paste. Honestly, I wasn’t sure this recipe would work — especially when I took the bars out of the oven. They were very soft and I didn’t dare cut into them because it was obvious they’d fall apart. But sometimes it just takes a little patience, so I let the bars cool on the counter for a while, then put them in the refrigerator for about an hour. Once cooled and chilled, they were very sturdy and sliced easily into perfect (well, almost) rectangles. 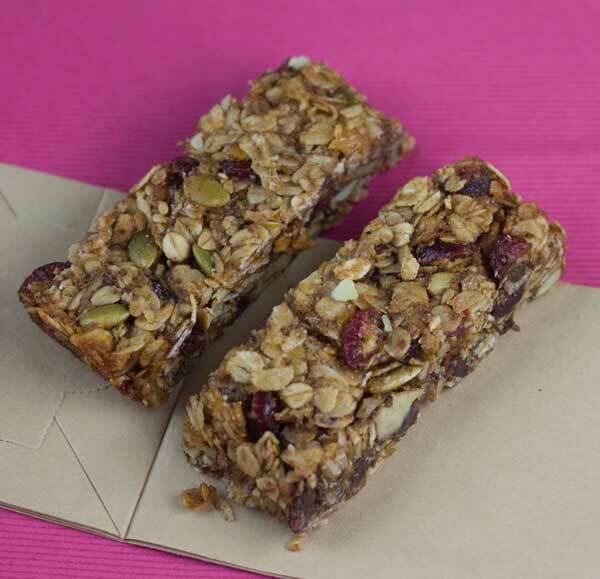 A chewy granola bar with lots of walnuts! This one is from the California Walnut Commission. Preheat oven to 325 degrees F. Line an 8 inch square metal pan with parchment paper. In a bowl, stir together the oats, brown sugar, flour, baking soda and cinnamon. 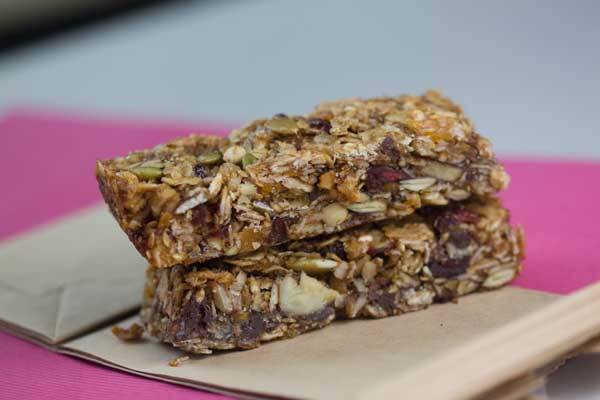 Stir in walnuts, cherries, chocolate chips, pumpkin seeds, coconut and sesame (or flax) seeds; set aside. In food processor, (a mini is okay) process apricots until broken up, about 1 minute. Add butter, process until a paste forms, about 1 minute. With motor running, pour in honey until well blended. If using a mini processor/chopper, just add the honey and process for a few seconds. Fold apricot mixture into oat mixture until well combined. Pat evenly into prepared baking pan. Press down as firmly as you can. Bake in the center of oven until golden, about 25 minutes. Transfer to rack to cool completely (don't even think about cutting while hot). Cut into bars. Liz, thanks for trying them and leaving a review! I appreciate it. Mmmm, I love trying different granola bars. Love the apricot paste idea. I’ll let you know when I make them. Sarah, I think Earth Balance would work. What could I use in place of the butter to make these dairy free? Oh my goodness these sound so good to me!! If I were home I’d run out and buy the ingredients to make them.